After demonstrating the maneuver at a high altitude, the pilot should reduce power and begin a descent at maneuvering speed in a continuing medium bank turn around the pylon. The apparent backward movement of the projected visual reference line with respect to the pylon will slow down as altitude is lost and will eventually stop for an instant. If the pilot continues the descent below the pivotal altitude, the projected visual reference line with respect to the pylon will begin to move forward. The altitude at which the visual reference line ceases to move across the ground is the pivotal altitude. If the airplane descends below the pivotal altitude, the pilot should increase power to maintain airspeed while regaining altitude to the point at which the projected reference line moves neither backward nor forward but actually pivots on the pylon. In this way, the pilot can determine the pivotal altitude of the airplane. The pivotal altitude is critical and changes with variations in groundspeed. Since the headings throughout turns continuously vary from downwind to upwind, the groundspeed constantly changes. This results in the proper pivotal altitude varying slightly throughout the turn. The pilot should adjust for this by climbing or descending, as necessary, to hold the visual reference line on the pylons. This change in altitude is dependent on the groundspeed. Selecting proper pylon is an important factor of successfully performing eights-on-pylons. They should be sufficiently prominent so the pilot can view them when completing the turn around one pylon and heading for the next. They should also be adequately spaced to provide time for planning the turns but not spaced so far apart that they cause unnecessary straight-and-level flight between the pylons. The selected pylons should also be at the same elevation, since differences of over few feet necessitate climbing or descending between each turn. The pilot should select two pylons along a line that lies perpendicular to the direction of the wind. The distance between the pylons should allow for the straight-and-level flight segment to last from 3 to 5 seconds. The pilot should estimate the pivotal altitude during preflight planning. Weather reports and consultation with other pilots flying in the area may provide both the wind direction and velocity. If the references are previously known (many flight instructors already have these ground-based reference selected), the sectional chart will provide the MSL of the references, the Pilot’s Operating Handbook (POH) provides the range of maneuvering airspeeds (based on weight), and the wind direction and velocity can be estimated to calculate the appropriate pivotal altitudes. The pilot should calculate the pivotal altitude for each position: upwind, downwind, and crosswind. The pilot should begin the eight-on-pylons maneuver by flying diagonally crosswind between the pylons to a point downwind from the first pylon so that the first turn can be made into the wind. As the airplane approaches a position where the pylon appears to be just ahead of the wingtip, the pilot should begin the turn by lowering the upwind wing to the point where the visual reference line aligns with the pylon. The reference line should appear to pivot on the pylon. As the airplane heads upwind, the groundspeed decreases, which lowers the pivotal altitude. As a result, the pilot must descend to hold the visual reference line on the pylon. As the turn progresses on the upwind side of the pylon, the wind becomes more of a crosswind. Since this maneuver does not require the turn to be completed at a constant radius, the pilot does not need to apply drift correction to complete the turn. If the visual reference line appears to move ahead of the pylon, the pilot should increase altitude. If the visual reference line appears to move behind the pylon, the pilot should decrease altitude. Deflecting the rudder to yaw the airplane and force the wing and reference line forward or backward to the pylon places the airplane in uncoordinated flight, at low altitude, with steep bank angles and must not be attempted. As the airplane turns toward a downwind heading, the pilot should rollout from the turn to allow the airplane to proceed diagonally to a point tangent on the downwind side of the second pylon. 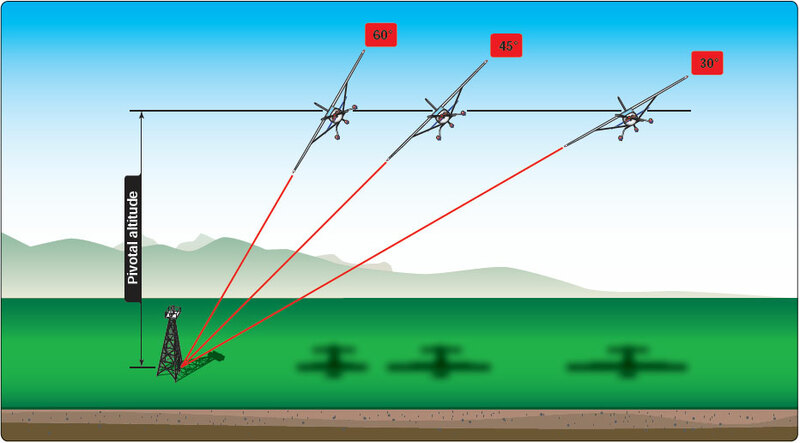 The pilot should complete the rollout with the proper wind correction angle to correct for wind drift, so that the airplane arrives at a point downwind from the second pylon that is equal in distance from the pylon as the corresponding point was from the first pylon at the beginning of the maneuver. At this point, the pilot should begin a turn in the opposite direction by lowering the upwind wing to the point where the visual reference line aligns with the pylon. The pilot should then continue the turn the same way the corresponding turn was performed around the first pylon but in the opposite direction. With prompt correction, and a very fine control pressures, it is possible to hold the visual reference line directly on the pylon even in strong winds. The pilot may make corrections for temporary variations, such as those caused by gusts or inattention by reducing the bank angle slightly to fly relatively straight to bring forward a lagging visual reference line or by increasing the bank angle temporarily to turn back a visual reference line that has moved ahead. With practice, these corrections may become slight enough to be barely noticeable. It is important to understand that variations in pylon position are according to the apparent movement of the visual reference line. Attempting to correct pivotal altitude by the use of the altimeter is ineffective. Eights-on-pylons are performed at bank angles ranging from shallow to steep. [Figure 6-14] The pilot should understand that the bank chosen does not alter the pivotal altitude. As proficiency is gained, the instructor should increase the complexity of the maneuver by directing the student to enter at a distance from the pylon that results in a specific bank angle at the steepest point in the pylon turn. The most common error in attempting to hold a pylon is incorrect use of the rudder. When the projection of the visual reference line moves forward with respect to the pylon, many pilots tend to apply inside rudder pressure to yaw the wing backward. When the reference line moves behind the pylon, they tend to apply outside rudder pressure to yaw the wing forward. The pilot should use the rudder only for coordination. Poor selection of ground references. Failure to maintain adequate altitude control during the maneuver. Failure to establish the appropriate wind correction angles. Failure to maintain orientation as the maneuver progresses.